Infants and toddlers: In this age group patients may present with irritability, lethargy, poor feeding, vomiting, and limited head control. Other signs that may be present involve cardiac and respiratory function such as irregular respirations as reflected by oxygen desaturations, apneic spells, and bradycardia. The sunsetting phenomenon and Parinaud syndrome can be detected during examination of the cranial nerves. Other signs are increasing head circumference (more than 2 mm/day or more than 1.5 cm/week), bulging fontanelle, prominent scalp veins, and suture diastasis. Older children: Signs of increased ICP include nausea and vomiting (especially in the morning) with the vomiting being projectile in nature sometimes. When the evolution is slower, children present with loss of milestones and behavioral changes. Further evaluation can reveal disturbed gait with frequent falls, upgaze palsy (Parinaud syndrome), abducens palsy, and papilledema. BUN and serum electrolytes: In cases of severe vomiting or poor feeding, electrolyte abnormalities can be found such as hypernatremia and hypokalemia in addition to hyperuremia. Additional sodium and osmolality abnormalities can be the result of the syndrome of inappropriate antidiuretic hormone secretion (SIADH), cerebral salt wasting syndrome (CSW), or central diabetes insipidus (DI). AFP and beta-HCG: Serum or CSF levels could be elevated in cases of germ cell tumors. 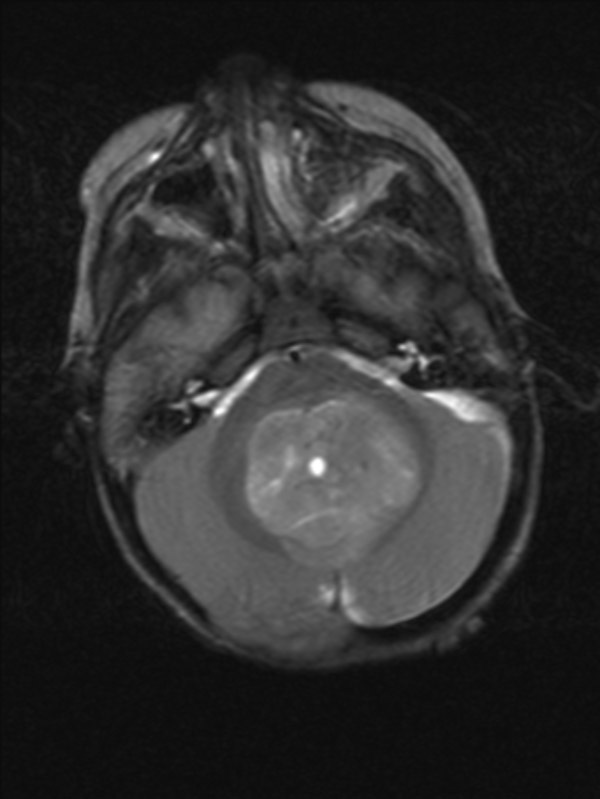 Elevations are not seen often with posterior fossa tumors. The following comments pertain only to the evaluation for hydrocephalus in children with tumors in their posterior fossa. Please see the chapters on Posterior Fossa Tumors in Children for information on the evaluation of the tumor. Detailed anatomical analysis: The presence of periventricular transudation of fluid in the white matter surrounding the frontal and occipital horns, seen most easily in the T2-weighted and proton density sequences, indicates the presence of elevated pressure in the CSF. Other indicators of acute dilatation of the ventricular system are the increased size of the transverse diameter of the third ventricle and the increased size of the temporal horns. These features, in association with the clinical state of the patient, aid the neurosurgeon in deciding on treatment. Third ventricular features (bulging floor, enlarged recesses, bowing of fornix, thinning of corpus callosum) could be assessed preoperatively to predict grossly the success rate of ETV. CSF flow studies: Advanced sequences and studies offer a detailed visualization of the ventricular and cisternal anatomy that can influence the surgeon’s choice of when and how to treat this type of hydrocephalus. Not usually indicated: Usually there is no time for such investigations due to the relative emergency element that accompanies these cases. Nuclear medicine shuntograms are minimally useful for diagnosing possible shunt malfunctions. Not usually indicated: Usually there is no indication for neuropsychological testing. In cases of slow tumor and hydrocephalus progression, with enough preoperative time, these tests could be used for postoperative comparisons in cases of posterior fossa syndrome and cerebellar mutism. Clinical findings: Symptoms and signs of increased ICP are indicative of hydrocephalus that needs treatment. 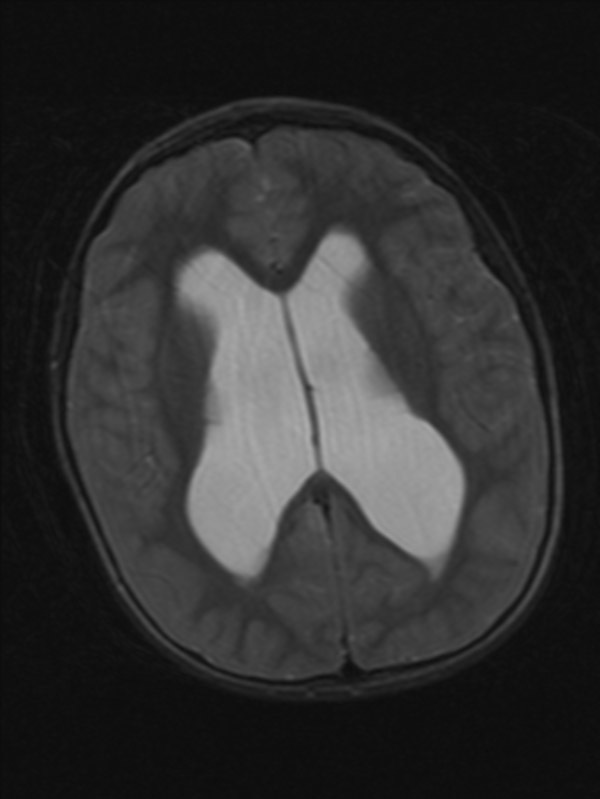 Imaging findings: Mainly on MRI scans, findings such as increased ventricular size with ballooned frontal horns, turbulent flow of CSF in ventricles, and periventricular halos are indicative of acute, obstructive hydrocephalus that needs active treatment. More detailed imaging of the ventricular anatomy, especially the features of the third ventricular walls (e.g., bulging floor, bowing of the fornix) can support the choice of an ETV.